Tally Youngblood eagerly awaits her sixteenth birthday when she will receive cosmetic surgery to become “pretty.” In her society, everyone goes through this rite of passage and Tally is no exception. As her birthday approaches, Tally meets another girl about to turn sixteen named Shay. Shay has a very different opinion of what it means to be “pretty.” She does not wish to receive any cosmetic operations, and chooses instead to flee. She leaves cryptic instructions for Tally should she choose to follow. On Tally’s birthday, she is transported to Special Circumstances, presumably to receive her surgery. Instead she is approached by a woman who informs her that she will not receive her procedure unless she helps locate Shay and a band of rebels. Tally feels she has no choice, and accepts the task. Eventually she finds the hidden town called the “Smoke,” but it is not at all what she anticipated. Tally’s loyalties are torn as she decides between being “pretty” and freedom. This book makes a very critical examination of society’s standards of beauty. 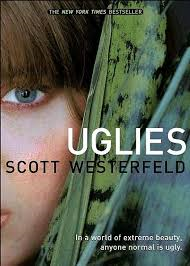 Westerfield has created a world where everyone becomes conventionally beautiful as they approach adulthood. The Uglies are isolated from the Pretties and made to feel inferior to their more aesthetically pleasing counterparts. As Tally begins to question what it means to be Pretty, Westerfield successfully gives the impression that appearances are not everything. He leaves readers with the impression that there is beauty in being flawed. This is an important message for teens who are bombarded with photo shopped images of celebrities and ads telling them that they should change their appearances. Tally, and subsequently the reader, learns that beauty does not equate to happiness, and self-worth should not be based on other people’s opinions. Pretty people are not necessarily good people, and Westerfield demonstrates that it is our inner qualities that should hold the most value. Reader’s Annotation: Tally desperately wants to be pretty. That is until she realizes that being pretty comes with an ugly cost. Married writer Justine Larbalestier in 2001. No kids; no plans for kids. Grew up in Texas, California, Connecticut My dad was a computer programmer in the 1960s-70s, when computers were as big as a house and came with a bunch of people to make them do stuff. He worked for Univac in its various forms, and we lived in Houston for the Apollo missions, in California for Boeing, and Connecticut for submarines, etc. Discuss inner beauty versus outer beauty. Justification of Selection: This book makes one think very hard on what it means to adhere to the physical standards of beauty espoused by society. It reveals that imperfection has its own kind of perfection.